An incomplete Neolithic polished axehead, dating to the period 3500 BC- 2200 BC. 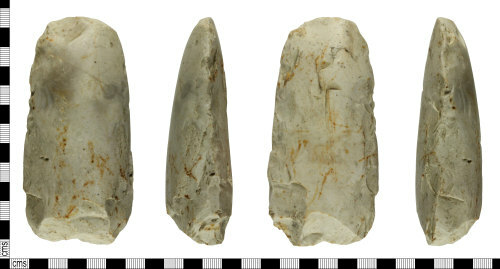 This appears to be the tip and most of the body, but as the cutting edge has broken off it is unclear how much of this is the original axehead. What remains is broadly oblong in shape, measuring 111.26mm in length, 52.92mm wide and 33.22mm thick, though it tapers to 7.33mm at the tip. In colour, the axehead is creamy-white, with patches of mid grey and flecks of light brown. The axehead is very smooth, heavily polished, with an abrupt break at the bottom, and small, scaled retouch or chipping on the left hand side of the ventral face. No trace of the cortex remains. In total, this polished axehead weighs 242.97g.